After some thought I decided to work with elements of weather so as to combine some aspect of the environment with this piece. I decided to work with wind and more specifically wind turbines. Whilst researching this topic I came across this wonderful photo of a park in Paris with green wind turbine trees http://www.alternative-energy-news.info/tree-shaped-wind-turbines-paris/. A little more searching and I found these white wind turbine trees http://www.fastcodesign.com/1663385/can-beautiful-turbines-help-critics-embrace-wind-energy. I thought the latter more beautiful although they somehow didn’t quite feel like trees so I opted to focus on the green one. 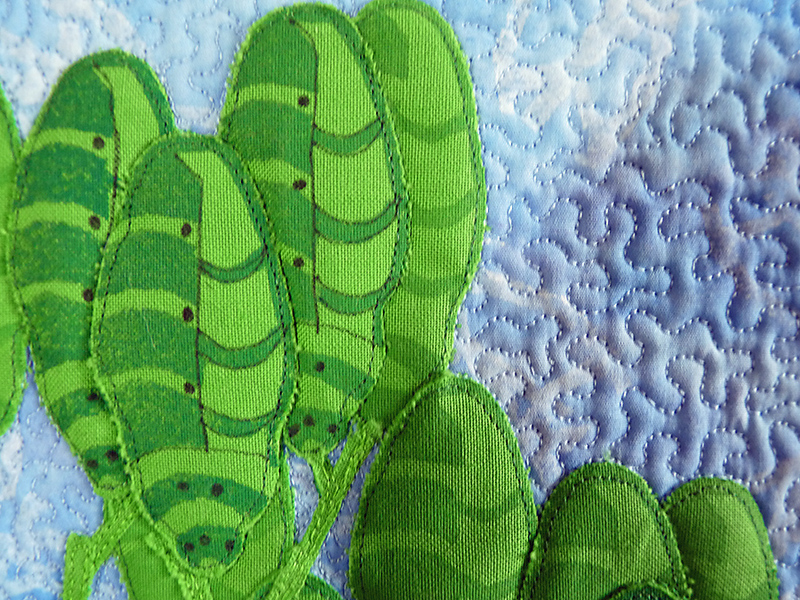 I didn’t find an image of these in green until after I’d started to work on the actual quilt! The background is a fabric painted wash overprinted for the “sky” area with wind turbine “clouds” fabric printed with hand-made stamps using the white turbine design. For the tree I found some commercial fabric in my scrap box that seemed to be approximately the right colour. 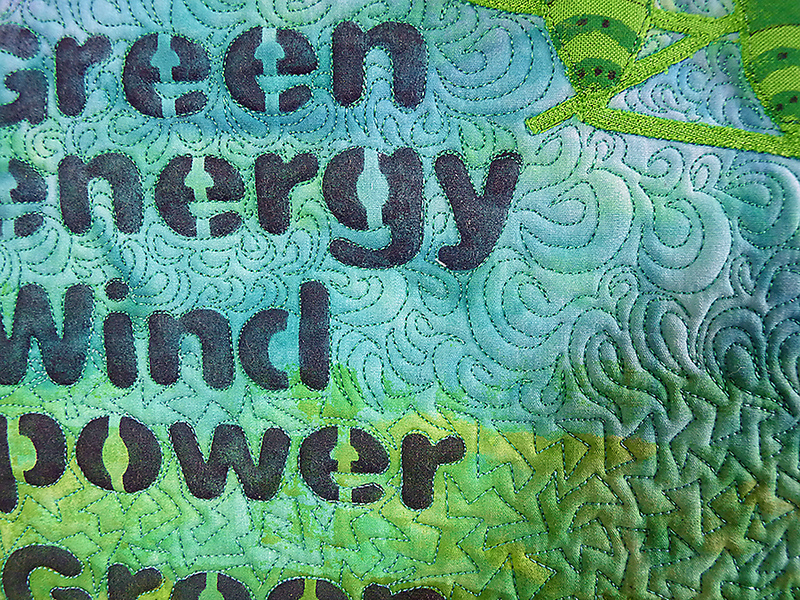 The turbines were again printed using fabric paint and a home-made stamp onto this fabric, this time using the green turbine design. The original tree “trunk” and “branches” were white but I found the contrast too extreme so opted to use the same green fabric. The lettering was stencilled using markal paintsticks. The tree has been fused onto the background in several layers and then free motion straight stitched to give some sense of depth. 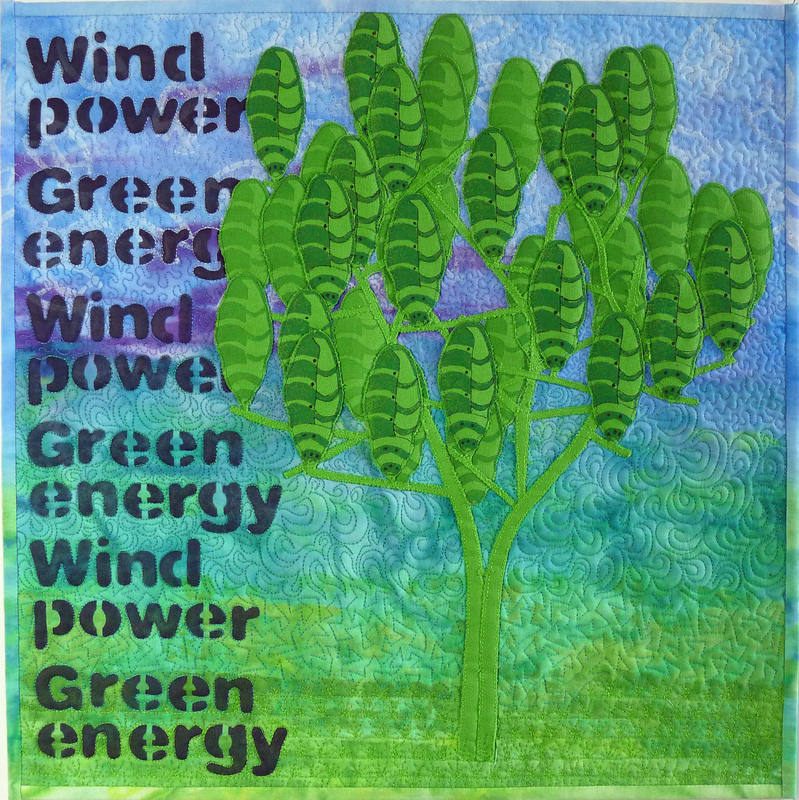 Various free-motion quilting designs have been stitched into the background and the tree has been defined by quilting around the turbines. A sharpie pen was used to define certain parts of the turbine. The quilt is bound using fabric painted fabric. Lovely; A really good concept beautifully interpreted. A powerful message so skilfully executed. The colour combinations are lovely. A very striking interpretation, and a unique approach to the theme. I really like your graphic lettering and simple lines for the tree. I looked it up on the internet and your interpretation is wonderful. Beautiful quilting! Gaye how fascinating, I looked at the link and a full credit to the French to harnass the wind and keep it environmentally friendly. 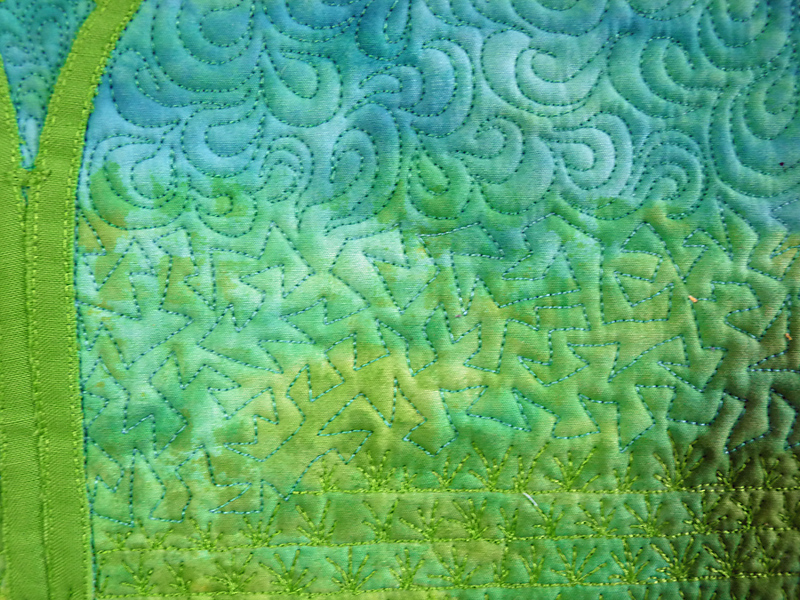 Love your use of colour, quilting is superb and hand made stamps for the lettering, wonderful show of your talents.